A solid-fueled Minotaur 4 rocket lifted off early Saturday from Cape Canaveral with a U.S. military payload designed to monitor satellite traffic in geosynchronous orbit. 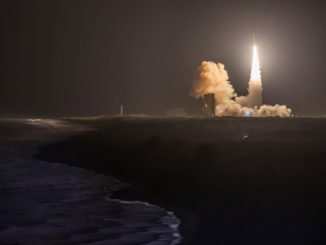 Receiving a boost from a modified decades-old Peacekeeper missile originally built for nuclear war, a U.S. military space surveillance satellite streaked into space early Saturday from Cape Canaveral to help the Air Force track threats and debris in orbit. 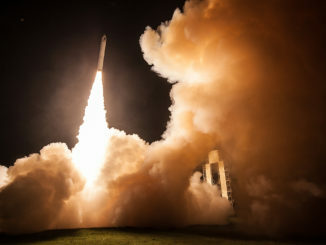 A Minotaur 4 rocket made up of five solid-fueled rocket motors delivered a U.S. military satellite tracking craft into an equatorial orbit early Saturday after lifting off from Cape Canaveral. 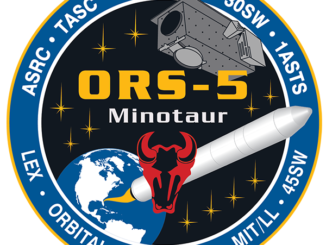 Track the major events during the Minotaur 4 rocket’s 28-minute climb into a unique equatorial orbit with the ORS-5 space surveillance satellite for the U.S. military’s Operationally Responsive Space office. An Orbital ATK Minotaur 4 rocket partially powered by modified motors from a Cold War-era nuclear missile lifted off early Saturday from Cape Canaveral with a small U.S. military satellite to help track other objects in space. 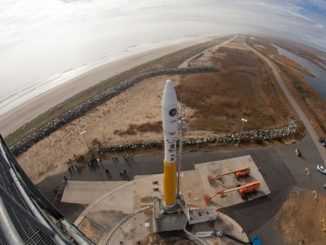 The solid-fueled launcher took off at 2:04 a.m. EDT (0604 GMT) after a weather delay. 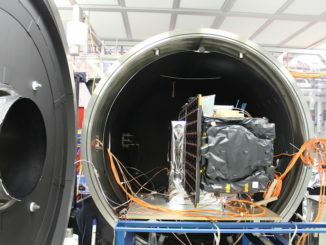 A U.S. military satellite awaiting launch Friday night from Cape Canaveral is small enough to fit on a coffee table, but it will punch above its weight, scanning a region more than 20,000 miles above Earth to catalog spacecraft movements and space junk. 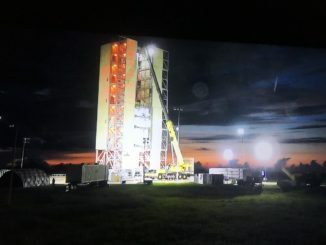 Using industrial cranes at a no-frills launch pad on the eastern tip of Cape Canaveral, a team of Orbital ATK and U.S. Air Force technicians have fully stacked a modified Cold War-era missile set for launch next week with a $49 million satellite built to track other objects in orbit. 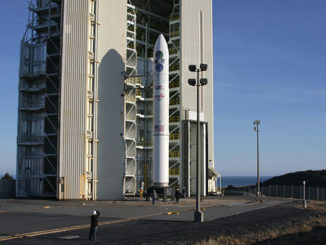 Ground crews at a long-dormant launch pad at Cape Canaveral are stacking surplus military missile motors for the Aug. 25 launch of a Minotaur 4 rocket with a satellite designed to track orbital traffic thousands of miles above Earth. 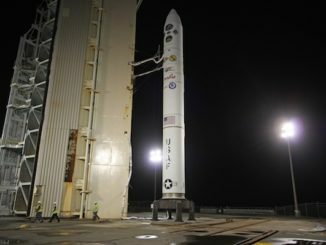 The launch from Cape Canaveral of a small U.S. military satellite built to track objects in geosynchronous orbit has been delayed from mid-July until August, an Air Force spokesperson said.